While the climo-blogosphere has been largely obsessed with the Murdoch empire’s desperate attempts to ignite Climategate-II, a lot has been going on. First of all, there has been an illustrative outbreak of press mishandling of a scientific paper showing a relatively low sensitivity. Planet3.0 has been in the forefront of trying to put it into an appropriate context. But watching its progress through the public digestion process is illustrative of our quandary. I repeat in this context a suggestion made by Eli: scientists should be held responsible for their institutions’ press releases. “Eli has a modest suggestion: Proposed outreach, so called “broader outcomes” have become an important part of grant applications and press releases are certainly an outreach. Require all press releases to be included in any grant renewal request. Let the reviewers at em.” Actually, maybe we (researchers) should just write them. Insofar as I can tell, press offices at scientific institutions uniformly subtract value. What do you think? Secondly, Watts is trying to do some revisionist history on the disastrous-for-the-denialati controversy at the journal Climate Research wherein genuine skeptic Hans von Storch and half the editorial board resigned because the journal wouldn’t withdraw an obviously inadequate publication by Soon and Baliunas. You can win in science but you can never win in politics. A few years later they’ll try to take a severe setback they inflicted on themselves and blame it on you. Is there any way that the world can actually develop a memory about these events? Fourthly, the COP is meeting at Durban SA, for a change not scheduled directly opposite Fall AGU, so somebody with ample funding might attend both. Unfortunately for all concerned, the expectations for this meeting are not so much low as abysmal. Is there a purpose to this charade at all? I suppose the best one can say is that as long as everybody keeps meeting every year, there is at least a venue to raise a prospective agreement once such a thing becomes politically feasible. Fifth, there is the upcoming AGU meeting itself. I’ll be there. Any sessions attendees should be sure not to miss? Any other topics you’d like to see covered on Planet3.0? José María Figueres — the former president of Costa Rica, former manager of the Davos World Economic Forum, and brother of Christiana Figueres, the executive secretary of the United Nations Framework Convention on Climate Change — told reporters there should be an “Occupy Durban” action by the nations most affected by climate change at the Conference of the Parties (COP). Hmm, I can't find a link for viewing submitted abstracts or any indication that one will be appearing. Any idea, Michael? It was easy to find two years ago and prior, but I couldn't find it last year either. I don't know what you mean. Is there some specific journal you are referring to? Sorry, I was referring to the AGU FM. Press releases are a messy business. I've been on the publishing side of one. 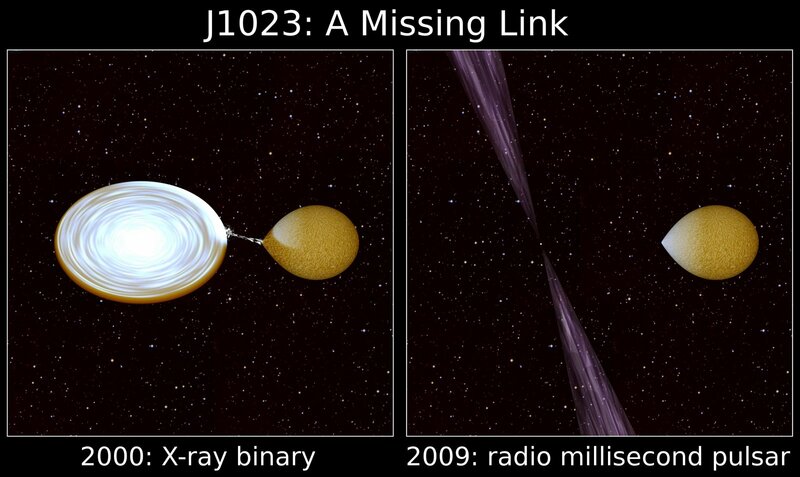 This was the article, about a newly-discovered millisecond pulsar that sheds some light on the process by which old slow oulsars are "recycled" into very fast millisecond pulsars. I went back and forth with the PR departments of both my own university and the National Radio Astronomy Observatory. Of course I tried to keep the science correct, but they wanted the press releases to be accessible. Those are genuinely conflicting goals, and the press officers are better judges than I of the degree of technical content that belongs in a press release. I'm reasonably happy with the results. I also worked with the press people to come up with some graphics. If you'd like to compare what I came up with with the press release materials, I wrote a couple of blog posts. Graphics-wise, a coauthor (Joeri van Leeuwen) and I came up with perhaps the best graphic. Did the PR folks improve on what we scientists came up on our own? I don't know. I've always found it hard to judge what's an appropriate level for the "general public". I think the right answer is good journalism: Wired had a rather good article, for example, because they had a good journalist call me up and talk on the phone about the article (she also called Don Backer, who was a top person in the field, and not affiliated with any of the eighteen authors). Science magazine itself did a pretty good job, soliciting an outside expert to write an article to put ours into context, and doing a rather good podcast segment. In short, I think that the problem is not so much the existence of press releases but the scarcity of good science reporting. Alongside the two quite good bits of coverage, there were a great many articles that were basically just some journalist editing down and reprinting our press release. These appeared not just in the generic popular press but also in various "science news" sources. Of course, we're lucky in astronomy that we only have to deal with lazy and sensationalist reporting, not the kind of politically-motivated attacks that you climate science folks have to put up with. Matthew Bailes wrote a nice commentary on this in the wake of the "diamond planet" furor. There is quite a positive view on the Durban meeting from Robert Stavins of the Harvard Environmental Economics Program http://www.robertstavinsblog.org/2011/11/28/can-the-durban-climate-negotiations-succeed/ (also posted at Climate Progress http://thinkprogress.org/romm/2011/11/30/377009/can-the-durban-climate-negotiations-succeed/ which made me appreciate their new formatting for the first time - I found it much easier to read there). Maybe I'm grabbing on this because I'm investing a lot of hope in the international process - my instincts are that there is more chance for those working on this issue internationally, and so less affected by balancing short term political considerations, to be free from the undermining effect of the constant stream of disinformation. "In particular, the UNFCCC principle of “common but differentiated responsibilities” could be made meaningful through the dual principles that: all countries recognize their historic emissions (read, the industrialized world); and all countries are responsible for their future emissions (think of the rapidly-growing, large, emerging economies of China, India, Brazil, Korea, Mexico, and South Africa)." What recognition from the 'non-Annex 1' contries about their future emissions would be sufficient to make progress possible? If they commited themselves to not exceding the global average per capita emissions (with possibly some account taken of exported emissions) would that be enough? It seems fair to me, but then a lot of things seem fair to me but apparently not to others! Anne, thanks so much for that example. And indeed that is a nice press release. It's so much more delicate for climate, when the way the press reads it is so much more like how they read political releases. Here is the Schmittner et al press release (the study referred to in ThingsBreak's excellent interview with Nathan Urban). It's really not terrible - the appropriate caveats sit in the right places. No scientist can be faulted for letting this out. But the caveats aren't stressed, and so the place of this contribution in the sensitivity literature is misrepresented. This doesn't overturn all the other studies. It is merely a modest outlier with an interesting methodology. The authors themselves have not had their views on climate significantly altered. This is not the first outlier. I am thinking of an Annan study that showed quite high sensitivity, that I believe did not get comparable press interest. I don't believe that James altered his prior much on the basis of his own work! Explaining how one can believe that one's work has value even though one doubts the result is an awful stretch for a press release form a press office. Perhaps the scientist is as clueless about the political implications of their words as the press office is. In the present case, again, I find little to fault in the release, where scientifically appropriate caveats do appear. But the press cannot be expected to read between the lines. The release should say "this is not the final word on the subject and there are several reasons that our estimate here could be biased, but we think the approach we used has value and is worth considering in future efforts". In the present case, ThingsBreak is the person who spotted this gap, and Planet3.0 is the venue he chose to address it, which is great for us as a site and a community. Once the swarms of spin-doctors infest your science, your press release typically needs reverse spin control. "This is a contribution" you should say "but not the final word". Disagree strongly about the release, Michael. You made the mistake of reading it from the POV of a scientist! The problem wasn't the overall content, although as you say a stronger overall caveat would have been better, but the fact that they "buried the lede" in the last four paragraphs. That communicates to journalists that the material there is less important. It doesn't do that with you or me, because we consciously read the entire thing so as to avoid that sort of weighting. But journalists, even many science journalists, aren't you and me. Even some of the best ones screwed this up, if nothing else giving it far more prominence than it deserved (vs. the untold number of more important papers that get no attention). Their collective lack of awareness (with definite exceptions, yes) of the history of sensitivity studies and in particular of low-sens outliers like Schwartz was a surprise to me. I quail at the thought of people like that trying to get Earth system sensitivity straight. I would have blamed all of this on whoever wrote the release, presumably the university press office, but Schmittner's public comments, in particular in the Oregonian piece (his local major newspaper), played to the weakness. To making internal navigation more convenient, I suggest adding recent comments to the sidebar inside articles. "This doesn’t overturn all the other studies. It is ... a modest outlier with an interesting methodology. The authors themselves have not had their views on climate significantly altered. This is not the first outlier. " "A reputable publisher corrects [or better, prevents] the mistaken impressions of his audience when they’re generated by content that he produced. So here we have a test of professional ethics." We need a "general public" focus group, to tell whether the context is successfully being conveyed. +1 SB. Also, how about a standing sidebar link to a "P3 Suggestion Box" thread? And in an ideal WordPress world, it'd be possible to have a "recent comments on (admin-specified) most-recent posts" widget with a separate "recently active (older) posts" widget; so comments on the suggestion box etc don't distract from more timely discussion. I'm thinking here about MT's Q "Is there any way that the world can actually develop a memory about these events? ", so those to whom the events are inconvenient can't erase them. IMO we need a SkepSci equivalent for climate "stories" like this, which are about events, not the science. Just a reminder, about the Climate Research von Storch resignation, Pat Michaels revisioned it almost 2 years ago, in the WSJ; this info's on his SourceWatch page. A suggestion box is a good idea for content, but don't expect too many technology changes for a while. We are pushing WordPress pretty hard as things stand. It often happens that adding one feature in WordPress breaks others, and we have a barely tolerable set of manual workarounds to manage already. My ambition is to rewrite the whole business from scratch in Django over the next year. Then we can add lots of features without relying on the somewhat fragile WordPress plugin architecture. One key idea is to have different comment policies on different articles. Another is to build a sitewide reputation system. Conceivably this can be done within WordPress but it's clear to me that a new CMS is ultimately needed for the type of thing we hope to achieve here. SREX on rainfall is actually somewhat illuminating: in places where it rains quite a bit there will be more, probably in extreme events; in places where it doesn't rain much maybe it'll rain less but when it does the rain is an extreme event. In other words, increasingly difficult to practice agriculture. Sheril has been pondering the press release problem as well.